The better she got at reading, the more Lilly Ann wanted to share her knowledge with others. Though it was not illegal for slaves to read and write in Kentucky, it was strongly discouraged. Sundays were the perfect opportunity for teaching while the master’s family went to church and visited friends. 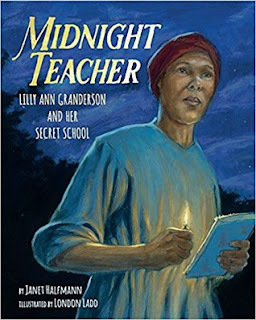 Lilly Ann found a hidden spot in the nearby woods where she gathered other enslaved children and began teaching them the alphabet. She did this for years, until her master died and she was sold to a planation in Natchez, Mississippi. In Mississippi, it was illegal for enslaved people to read and write. “Landowners feared that if the enslaved could read, they would discover that some northerners wanted slavery abolished. this might lead to rebellion agains the owners.” Another fear was that If a slave could write, they might forge a travel pass and escape to the north. Yet, Lilly Ann found a way, despite the risk to her life. The engaging narrative is enhanced by the illustrations, done primarily in acrylic paint in a painterly style, by artist, London Ladd. Click here to learn more about Ladd. The lengthy author’s note gives more detailed information about Granderson. Back matter also includes selected references, and quotation sources. My daughter would love this. Thank you! Thanks so much for sharing the story of this brave and inspiring teacher. I'm so hoping that the name Lilly Ann Granderson becomes a household word. Happy Reading to All!